This video is a demo of the original version of this patch. The updated version sounds significantly better. We’ll have a new demo up soon! The notes below describe what you get in the updated version. This patch re-creates the sounds made popular by Bethel Music. We built it out based on a number of references to boards and amps used by their guitar players. We feel this patch sounds great on just about any Bethel Music song, and works with a wide variety of different guitars and pickup types. 1. UPDATE YOUR FIRMWARE: Please upgrade the firmware on your Helix and the HX Edit software from Line 6 to the latest before installing this patch. Even if your Helix is up to date, the ‘HX Edit’ app needs to be updated as well. If you get an error importing a patch, the problem is most likely outdated firmware on your Helix/HX Edit. 3. 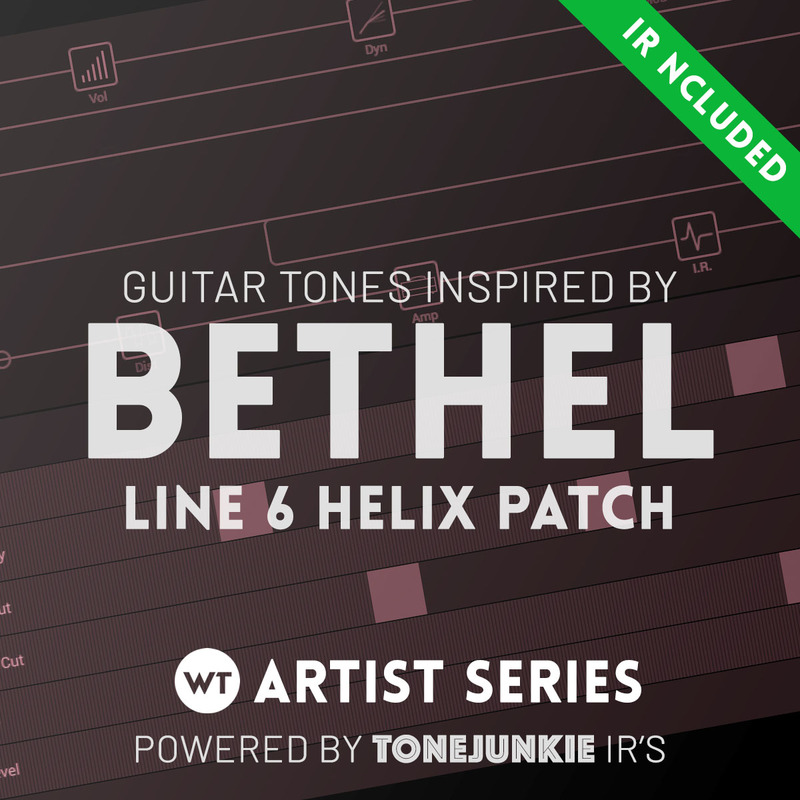 IR CAB INCLUDED: This download includes premium IRs from Tone Junkie. We matched these specific IRs to this amp, but feel free to experiment with other IR’s for different tonal options. We’ve also included a stock cab version of the patch, but we urge to try the IR – it really does sound better – and it’s included for free :). TJ 14 GOLD Fathead+57 . In our Helix, it’s in IR slot 14 (this will always correspond with the number after ‘TJ’ in the file name). To import an IR, switch to the ‘IMPULSES’ column (next to the PRESETS column), and drag & drop the IR into the appropriate slot (see note above). The image below shows the IR column and IR Block selection. PLEASE NOTE: If you do not have the IR loaded into the ‘IMPULSES’ column, the patch will not sound correct, even if you have the IR block on – you must drag and drop the IR into the IMPULSES column. This patch is meant to be used in stomp box mode or snapshot mode. We recommend setting up your Helix to use all ten stomps. The Helix LT does not allow 10-button stomp mode, so you’ll have to re-arrange the button assignments to suite your preferences. The pitch whammy is a specialized effect, and we’ve implemented it in a unique way. You hear it prominently in the chorus of the song “Glory to Glory”. The pedal bypass is assigned to a footswitch while the pitch parameter is mapped to the expression pedal (EXP 1) – this mimics the actual Digitech Whammy pedal. The way we like to use it is to first switch the expression pedal to EXP 1 and keep it in the heel down position. This sets the pitch to 0, so it is essentially off. You can turn on the pedal and there will be no change in pitch. Then you can move the expression pedal in the toe-down position to shift the pitch up by one octave. Snapshot 1: CLEAN AMBI. Ambient clean tone. Snapshot 4: LEAD: Big drive with delay and big verb. Snapshot 5: CLEAN – Less ambient clean tone. Snapshot 6: DRIVE AMBI – Ambient version of the DRIVE snap. Snapshot 7: DRIVE+ AMB – Ambient version of the DRIVE + snap.